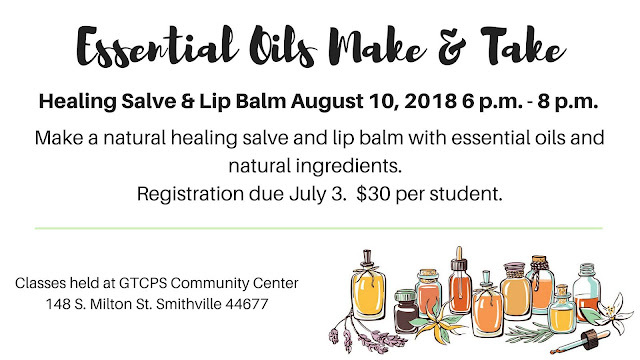 Learn how to make a healing salve and lip balm with essential oils and natural ingredients. Classes are held at the GTCPS Community Center at 148 South Milton Street, Smithville. All supplies and essential oils are included. Cost is $30 per student. Save $5 when you sign up for two classes. Save $10 when you sign up for three classes. Spaces are limited. Register by August 1 to reserve your spot. Please contact the instructor at cari@gtcps.org or message the page to register. Payment can be made through Paypal, by mailed check, or in person at the center by appointment.